The Yoga Asanas have acquired an importance which has a twofold character. They are not only a set of all-round physical exercises but a preparatory stage for the practice of Yoga. Both the Hatha Yoga and the Raja Yoga prescribe these techniques of Asanas for the purification of the body and the setting of it in tune with the nervous equilibrium that is necessary for engaging oneself in the higher concentration. 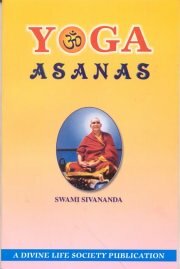 The author, Sri Swami Sivanandaji Maharaj, describes in the present volume the Yoga Asanas in a homely way so that they may be intelligible even to a layman. Highly technical descriptions have been purposely avoided to enable the common man to derive benefit from them easily and to introduce him to a realm above his usual worldly routine. Important postures are illustrated separately for practical guidance in Yoga Asana practice, though it is always advisable to learn the Asanas directly from a teacher. Bibliographic Information: xxxi + 164p. illus., Gloss.